As every day passes, I find myself getting more and more comfortable in my life here in Bali. So comfortable in fact, that I have began to feel that traveling outside of Bali is more of a nuisance than an exciting new adventure. So, when it was time for us to travel yet again to Jakarta… I had mixed feelings. It seemed that everyone I asked about Jakarta had the same response: “…the traffic is horrible” or “…be prepared to spend 5 or more hours in traffic”. Already not too eager to leave my beloved Bali and dreading the unavoidable Jakarta-traffic, left me less than thrilled to visit the concrete jungle. Hearing all of the horror stories also has it's ups! I was able to find many reasons to be optimistic! Such as: Having the chance to see where Estelle grew up; being able to meet some of Estelle’s awesome friends; having the chance to attend one of her best friends weddings; and after all it was a NEW Adventure! I needed to remember the most basic rule of happiness: carry no expectations and be present in all life’s precious moments. Okay, Jakarta… ready or not here I come! What Did We Do In Jakarta? Our first full day in Jakarta started by going to one of the one million shopping malls that the city has to offer. Estelle brought me to a salon to have my first Cream Bath. Okay, for my non-Indo friends - its not what you think! It’s really just getting an awesome head massage and having some natural ingredients rubbed into your scalp: in my case Aloe Vera! From what Estelle tells me... it is very common and many dudes get it done - so I haven't lost my man-card. Afterward the relaxing head rub, we boarded a cab for my first experience of Jakarta's traffic! Estelle was sure to check that we had some food for the potentially long cab ride. A whirlwind of watching "The Intern" (a film we've been to see and a must watch), meeting Estelle’s friend for dinner and finally catching up with her cousin, Ersan for a late night coffee. Our last day before heading of to Puncak for her friend Martini’s Indonesian Wedding Reception, we connected with Estelle’s former boss for dinner and an adventure nonetheless! He is a dynamo of a guy – non stop energy – and 100% hilarious! I have no idea how many businesses he owns/runs but lets just say he is uber successful. After a most entertaining dinner – we had to grab our bags and then continue onward to more of Estelles’ close Jakarta friends for drinks. We took a Bajaj from Jill’s to the bar – what a rush! After hanging with the Jakarta crew for a bit we were off again! We got picked up and rode with the wedding party (Martini and David) for the 2+ hour drive to Puncak. We stayed 2 nights at a resort on top of the mountain and it was great! The area is known for the tea which is grown EVERYWHERE. 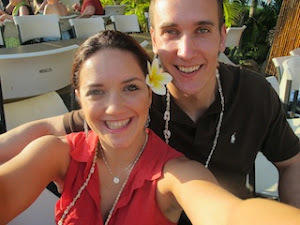 While there, we went on 2 “unofficial” Tea Tours and really just relaxed and hung with the awesome newly weds. The resort had a pool table so we obviously made use of that and on our last night Estelle and I killed the Beatles song “Black Bird”. But, it so happened that Estelle’s best friend Christina, who is a airmen for the U.S Navy was still in Jakarta for one more night. And so the universe realigned our route to allow the girls to get more bestie time in as i myself made a new furry friend! What is the best part of living in Bali? It happens to be a destination that couples flock to when deciding to tie the knot! So instead of having to fly to paradise to attend a wedding - the wedding came to me! Yay! This was a very unique circumstance because it was a high-school friend who was getting hitched. This meant that I was able to meet with friends I hadn't seen in years! This was also the perfect time for Kurt to meet many of the friends I grew up with in Jakarta. 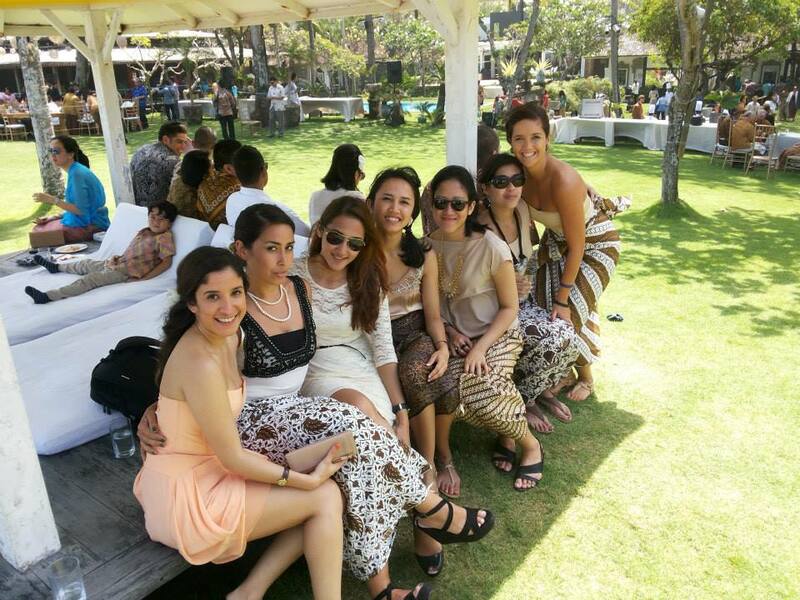 Bachelor and bachelorette festivities, traditional ceremonies and the big day blurred into one weekend. 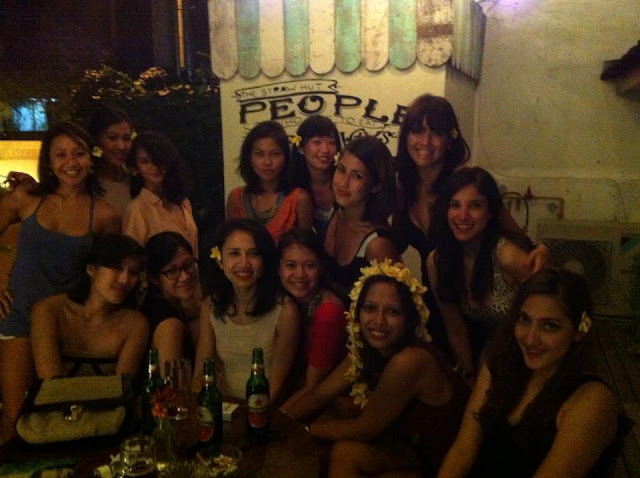 I have known almost all of the girls in the photo below for over 13 years. The friendships that you share with those that you grew up with are really special. These are the people that witnessed your many awkward teenage moments: braces, baby-fat, horrid fashion, hair-coloring-gone-wrong and everything else that comes with growing pains. They truly love you for you because they've seen it all. What I enjoy the most about these friendships is that it doesn't matter how much time passes -you pick up as if you saw each other last week. If the bride gets home in one piece - I'd say it was a successful night! Amen! I remember as a kid I would despise attending any traditional ceremonies. It was always hot and there were always chubby, old aunties who pinched my cheeks and smothered me in their breasts. 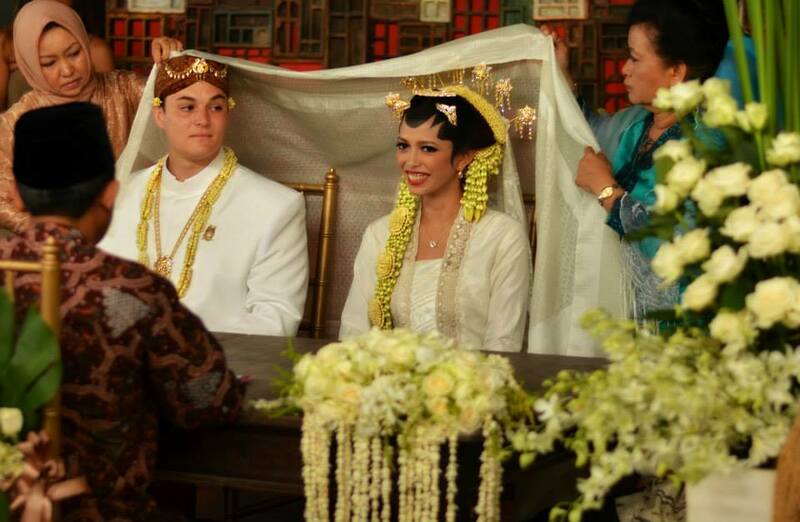 I am really glad that Deyta had a traditional wedding - and more so that I decided to attend it. There is a special part of the Javanese ceremony that the bride's father and the groom make a special agreement. They agree that that the groom will take full responsibility of his daughter from that day forward. It is an emotional and beautiful tradition and i feel very blessed to have been there to witness it. The venue was a a fairy-tale. The stars and the Christmas lights blended into the night. The wedding was held at an art-deco villa that boasts hundreds of artifacts from around the globe. Infinity pools on rooftops, floating beds, the view of the ocean and an endless garden that reminded me of an enchanted forest. A buffet that could could feed you for days, slushy margaritas, lobster (that i couldn't enjoy because of my allergies but i heard was AMAZING) and a mountain of desserts! In the midst of all the crazy-ness of all of these festivities, Kurt also had his college buddy in town for 3 weeks! This was really special because we were able to combine both of our worlds and experience Bali with friends from all over the world. This was Dan's first trip overseas (outside of the U.S, Mexico & Canada) and he shared with us that it has opened up his eyes to so much. What a treat to have him come see where we live! 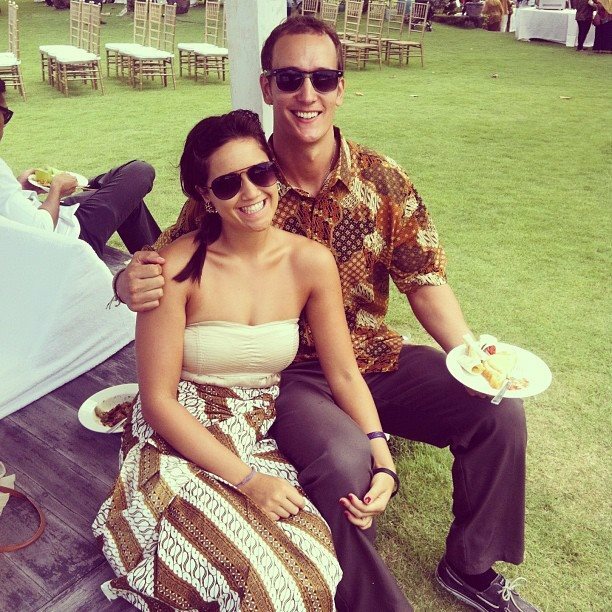 It was fun to have Kurt dress up in traditional batik and to have him spend some time with my close friends. 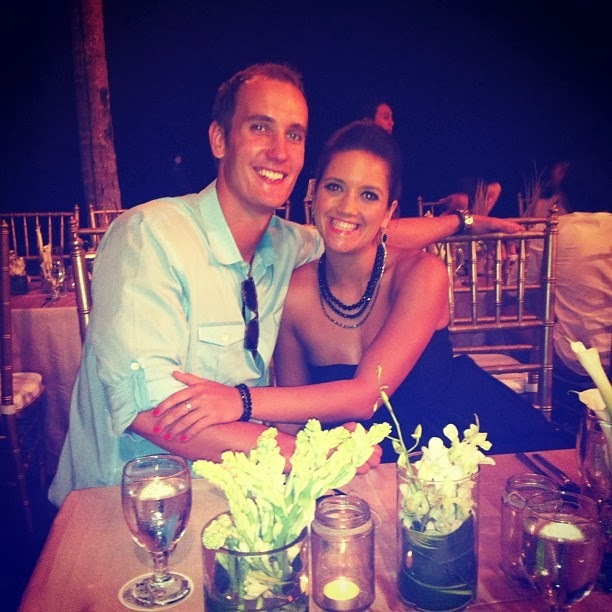 It was really great that he was able to get to know everyone a few days before the wedding! Kurt and Dan participated in the bachelor party for the groom and many beach days with the bridal party before the big day. Living in Bali, we know that this is mostly a vacation destination for most. This is great because we get to see so many people, but also sad because they all leave. C'est la vie! Off to Jakarta for another special wedding reception! Will write again soon! Have you ever had the sense that today you could do whatever it was you wanted? Or how about for a week? Or even a month? A year? Welcome to my life. Everyday I wake up and literally have a clean slate to do with what I please. No more 8-5 at the office and helplessly trying to juggle my post work workouts and my social activities with friends and family on the weekends. No, no... I can do anything that I want…Go to the beach, go to one of my local coffee shops, sleep in, go workout, or do absolutely nothing. A funny thing happens – or should I say happened to me. I have realized that the “structured Kurt” (who I have endlessly tried to ditch and replace with the just “go with the flow Kurt") is in reality rather stubborn. What I have come to know about myself is that I really do need some structure, otherwise I don’t feel good internally. And more than that, I guess I just need to be minimally “productive” with my day to feel fulfilled. Whether that means to spend 2 hours a day working on one of my online businesses or writing this blog entry – I feel way better once I complete my “goal of the day”. But once I do complete it – I then feel like I can do what I feel like…e.g. surf, beach, read, gym, etc. So what I have decided is that the “semi structured Kurt” is the way to go! So what does this mean beyond the day to day? Now comes the very BIG question…how should I spend all of my time and energy? Having a corporate job for 9 years, I didn’t have the luxury of doing what I wanted – you have to act and do what’s in the best interest of the company and now suddenly I can actually spend it on what I want to. I have decided for my year here that these are the goals that I wanted to accomplish. In the spirit of accountability I have decided to share them with you so that you (friends and family) can help keep me on course. But please keep in mind – there are likely to be several course adjustments along the way. Becoming an Internet Marketing Ninja! Well, wish me luck on this! I plan on keeping you all updated on my progress... whether it is triumphs or setbacks! OK friends I gotta run!